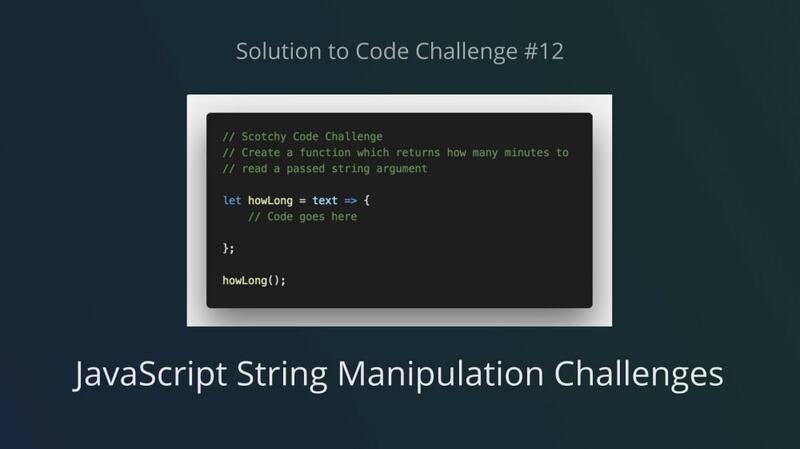 Last time on the code challenge #12 we looked at problems involving the use of String Manipulation techniques. Yet to try your hands at the challenge? You can check it out here. You can also see other fantastic submissions in the Spectrum Chat. In this post, we shall be solving these awesome challenges and you know the best part? Chris did really cool videos to better explain these challenge solutions! Next, we shall go over each individual challenge. Whilst you see an overview of how it was solved, Chris provides an awesome and more detailed explanation in his video for each challenge. https://www.youtube.com/watch?v=HGMiRv0HAss&list=PLrskRAE1nhTx1bGx9myzy4knXZtS_PIMr&index=1 In this challenge, we are required to pad individual numbers in an array such that single figures from 1-9 are padded with a preceding 0. A padNumber() function is created, which utilizes a ternary operator to pad numbers less than 10. Subsequently, a .map() function is used to iterate over the array and apply padNumber to each number in the array. // Pad given single numbers in array to look like "10", "05", "16", "02"
The goal of this challenge is to convert a provided string from camelCase to Title Case. Add a space before all uppercase letters using regex. Convert all text to lowercase and trim for spaces. Convert text array into a string and split back into an array. Join the array into a string. const camelCaseText = "the simplestThings in LIFE are alwaysThe best"
In this challenge we&apos;ll be converting text in titlecase to camelcase. Convert the sentence to lowercase and split into an array. Loop over every two words and create a camelcase pair off them. Push the pairs into an empty array. Convert the array to a string. const newTitle = "These Words Should Go In Pairs"
For this challenge, we will be implementing a popular feature in several blogs which displays the time to read a piece of text. Note: The average human reads 200 words per minute. To solve this challenge we simply cleaned the passage, split the passage into an array of words the found the average time to read the passage taking into consideration the number of words a human reads per minute. The resulting time is returned in minutes or seconds if less than a minute. All figures are rounded to whole numbers. // How many seconds will it take to read the provided text? // If it goes past 60 seconds, quote in minutes! In words that begin with consonant sounds, all letters before the initial vowel are placed at the end of the word sequence. Then, "ay" is added. When words begin with consonant clusters (multiple consonants that form one sound), the whole consonants before the vowel is added at the end followed by an "ay". In words that begin with vowel sounds, one just adds "ay" to the end. Create a regular expression which holds the 5 vowels. Find the index of the first vowel occurrence in the word. Create a main condition which verifies if the word starts with a vowel. Use a ternary operator to manipulate the word based on the truthy or falsy of the main condition.